Antique American shaped tole box with gilt foliate decoration on front and polychrome peacock and floral decoration on hinged lid. Circa 1850-1870. Provenance: Estate of Ruthann Coggins Bardes, Greewich, CT.
Fine English Regency serpentine front tortoiseshell tea caddy with panels of mother of pearl and abalone; silver escutcheon; ball form coquilla nut feet; having two interior compartments with tortoiseshell lids, which appear to retain remnants of the original tea pewter lining. Circa 1820. (Minor repairs to the tortoise. Antique English Desktop Cabinet, having a central panel door, inlaid with an oval patera and striped stringing, and flanked by six small drawers. Predominantly 18th Century. Antique English papier mâche lap desk in black lacquer decorated with gilt stencil and inlaid with abalone shell, having a shaped top opening to a fitted interior with writing slope and wells for pens and inkwell. Circa 1860. 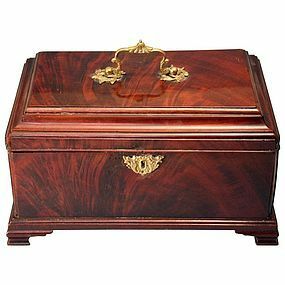 Fine George III Tea Caddy in tiger mahogany with satinwood stringing, octagonal, with ebony escutcheon. English, Circa 1790. Provenance: From the Estate of Joseph Stanley. 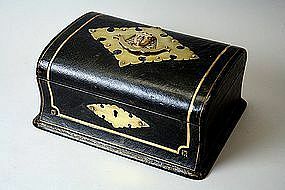 Antique English tooled and gilt leather jewelry box with brass mounts having domed rectangular lid with egyptian motif decorated handle opening to a fitted felt lined interior with lift-out tray. Circa 1880. **Regarding the Sale of Items Incorporating Materials from Endangered Species: An export license issued by the U.S. Fish and Wildlife Service will be required for the export of this item from the U.S. Prospective purchasers are responsible for obtaining this form. 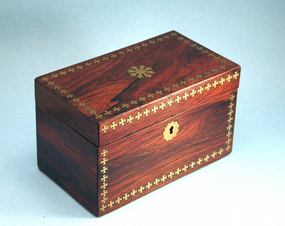 Antique Rosewood Tea Caddy inlaid with brass stars and opening to two lidded compartments. Two Antique English papier mâché shoe form match safes (or ‘vesta cases’) with handpainted decoration, oval hinged lids, and ‘strike’ on bottom of shoe. Circa 1870. 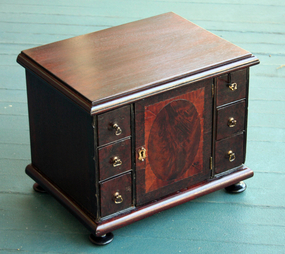 Fine bombé black lacquer tea caddy with Chinoiserie decoration, fitted interior and later squashed ball feet. English, Circa 1870. 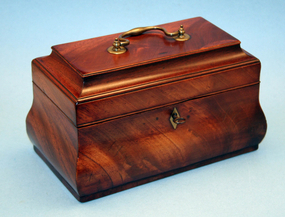 Large Georgian Tea Chest in nicely figured mahogany; rectangular with quarter column corners, having a stepped lid surmounted by a brass carrying handle and opening to a fitted interior retainiing two tin tea caddies and a sugar box and the whole raised on ogee bracket feet. English, Circa1780. 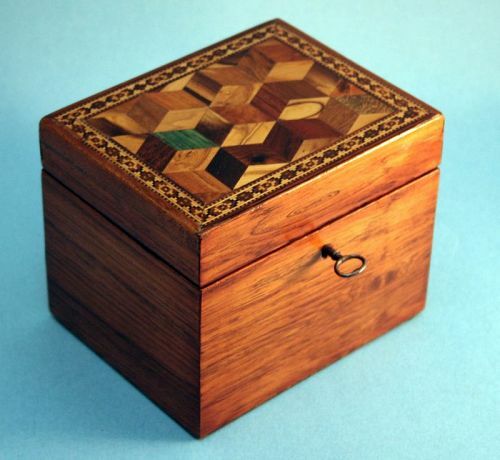 Antique English Tunbridge Tea Caddy, with the lid inlaid with the "Tumbling Blocks" pattern. 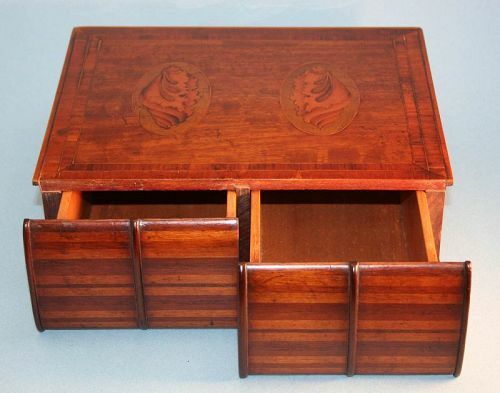 It is unusual to have the tumbling blocks in a variety of exotic wood samples. Made in Tunbridge Wells, circa 1860. Antique English Burled Walnut Tea Caddy, with two bands of inlaid "whittlewood" decoration and a hinged lid opening to a divided interior. Circa 1870.